“Jason – where’s Jason? We need Jason!” A cry heard so many times across our site, and countless others. For Jason is our geoarchaeologist, a specialist in all things -well- geological! He is part of a team of specialists we have at MOLA whose job it is to excavate, record and analyse land formations and past geological events that can be seen in the soil horizons. Their interest in a site generally starts when the archaeologists have removed the evidence of human activity, although the line is never that clearly defined! Jason is an excellent archaeologist as well, so you often find him on site merrily digging away archaeological deposits and features (don’t worry, he is allowed to). Jason has been working at MOLA for 6 years now, initially as a digger, then moving into the geoarch team full time about 2 years ago. Jason wanted to get into geoarchaeology after his first research project with UCL. He carried out an auger hole survey in Sussex and got hooked on the environmental side of archaeology. And so his interest grew; and it is an interest in all things soil that Jason says is the main requirement for the job! Oh, that and a year studying for a Master’s degree in Geoarchaeology at the University of Reading… and a good pair of wellies. So what does a geoarch do all day? 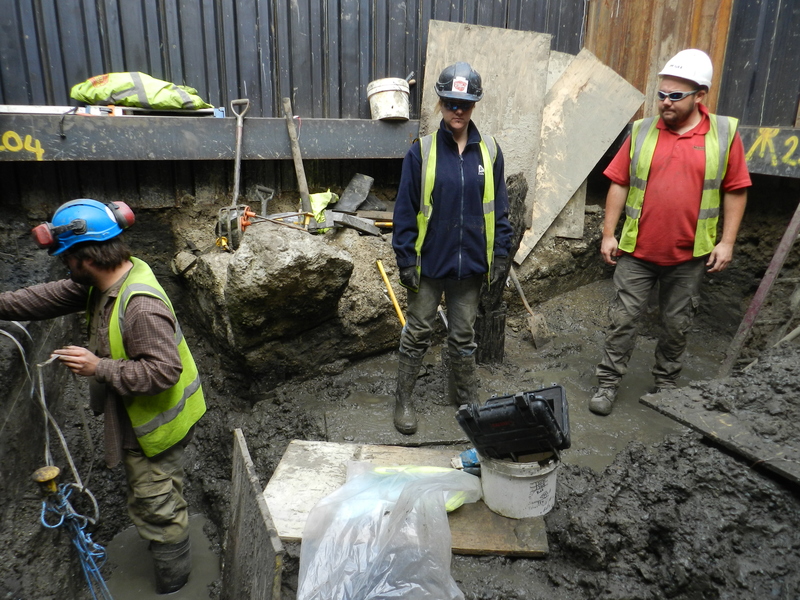 Well a variety of things, but their on-site work often requires a lot of waiting for holes to be dug and then frantic cleaning, sampling and recording of sections through features such as river beds, channels and prehistoric horizons. The geoarch work is always ‘the last thing that needs to be done’ hence the frantic search for Jason as we usually have limited time for him to carry out his work. But never once has Jason complained about this (well not to our faces!). 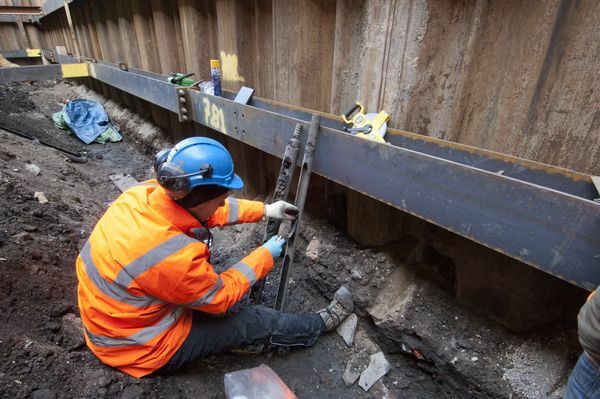 Geoarchs also carry out excavations, auger hole and bore hole surveys in their own right, and complete watching brief monitoring of geotechnical pits and bore holes. 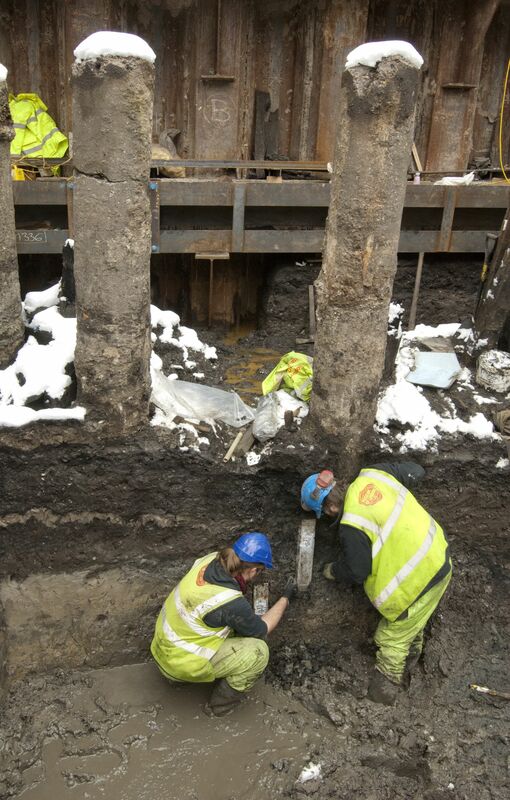 Whatever the site, you can guarantee the work will be muddy and wet, and the holes will be very, very deep. All of this needs to be written up so they do get to spend some time in the warm, dry office on occasion. Geoarchs often need to take samples of deposits to analyse more closely back in the office, most commonly taking bulk samples in our white buckets, or monolith samples in rectangular tins (as in the picture above). The bulk samples provide an example of one deposit type (or context), whereas the monoliths are usually samples through several layers and can provide information on their formation. The geoarchs are also responsible for our C14 dating. So with the sodden site conditions one may wonder why Jason does this job at all… well he says it is because it is interesting. He gets to look at the interplay between humans and the environment; he sees the impact we have had over thousands of years and gets to investigate how the climate and the weather have changed the world into what we see today. He enjoys the difference in scale, looking at the micro (the individual) all the way through to the macro (the landscape as a whole). And on occasion, like on larger projects such as ours, he gets to play with cool mapping software and create visual representations of how the landscape may have looked. MOLA is pretty lucky in that we have a whole team of geoarchaeologists at our disposal, and to us archaeologists they possess highly valued skills. To most supervisors gravel looks like gravel, but to a geoarch it provides clues to how past landscapes formed – and could even be a never before seen formation that they get to name*! *Jason terrace gravels yet to be discovered.